Can't decide between shortbread cookies or peanut butter cookies? Now you don't have to choose! 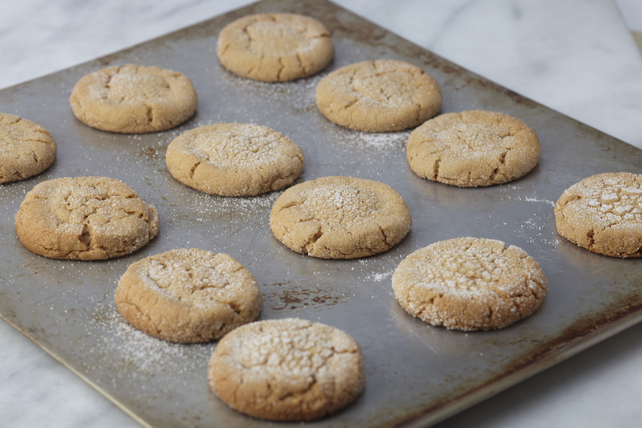 These sweet treats are the perfect hybrid between shortbread and peanut butter cookies that you didn't know you needed in your recipe archives. Rolled in icing sugar, these tasty little twists on snowball cookies are sure to delight any cookie lover. Combine flour and salt. Beat butter, peanut butter and vanilla in large bowl with mixer until blended. Add 3/4 cup sugar; beat until light and fluffy. Gradually add dry ingredients, mixing well after each addition. Roll into 28 balls, using about 1-1/2 Tbsp. dough for each ball. Cover baking sheets with parchment. Measure 1/4 cup icing sugar into small bowl. Add dough, 1 ball at a time, turning to evenly coat all sides of each ball with sugar. Place, 2 inches apart, on prepared baking sheets. Flatten by using fork to make crisscross design in each top of ball. Bake 14 min. or until centres of cookies are almost set. Cool 5 min. Remove cookies to wire racks. Sift remaining sugar over cookies; cool completely. Store in airtight container at room temperature up to 1 week. Beat 1/2 cup chopped pecans into dough before rolling into balls.